Our Craftsmans Pine range of staircases offer supreme quality and value, these staircases offer the ideal base for a good structural staircases when using many of our other stair balustrade options. Our Trade range softwood staircase with our Pine square specification is the entry level specification with pine 32mm square balusters and 90mm Square Newel posts. 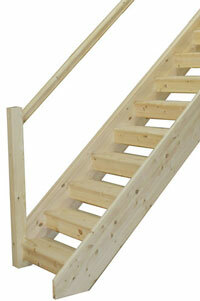 The Trade Range Staircase has a MDF tread as standard. 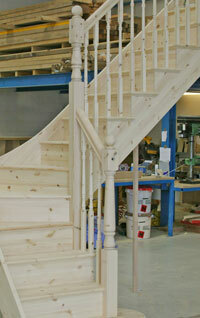 This staircase has our Pine standard 90mm newel turnings and 32mm Pine georgian spindles. 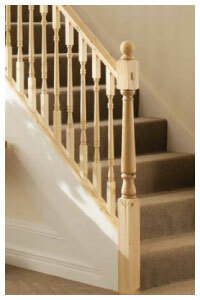 Turned Spindles and Newel posts are a balustrade option on our Trade Range and Crafsmans Pine Staircases. 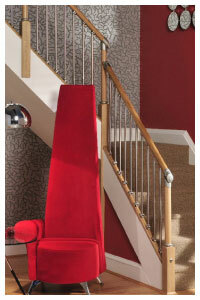 The Fusion handrail system is a popular contemporary balustrading system combining metal and wood. 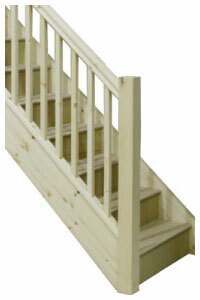 This is an option on our Trade Range and Crafsmans pine stair specifications. 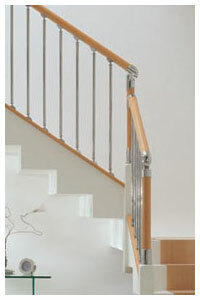 The Axxys origin system offers a more classical option to the popular Fusion handrail system. 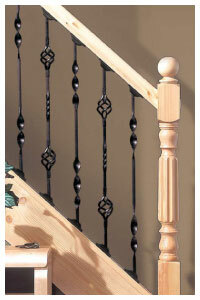 Pine with Black metal balusters, we offer a selction of Metal balusters. 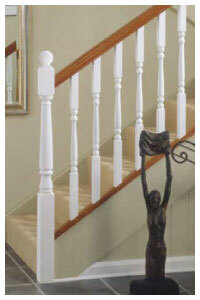 This is a balustrade upgrade option for closed string staircases. 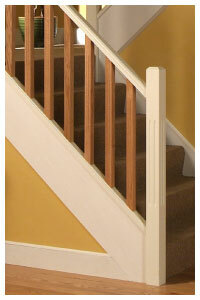 This shows you the style if you have the handrail and baserail in hardwood with the rest painted. Axxys Evolution system is very similar to the Fusion balustrade system but with a few little extra flare available with a complete range of Handrail fittings. Otherwise known as the double Reed style of Spindles and newels this range offers a little more detail to the standard Square or Stop Chamfer. 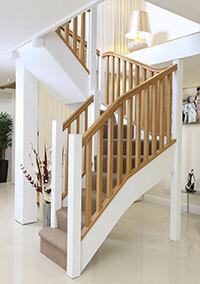 We offer a Traditional Pine Openplan staircase design, this is more expensive than a conventional closed riser staircase due to the extra work involved. 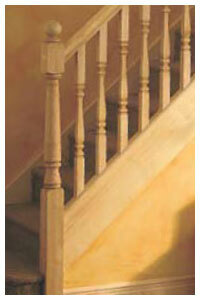 Provincial square Profiled Newel posts and Spindles offer a alternative to Turned spindles giving the staircase a chunkier feel. The New Axxys Squared system offering a combination of Oak and Metal. 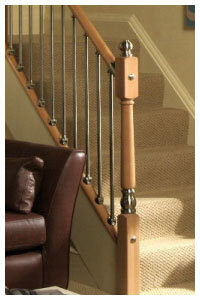 shown here on a Oak closed string staircase. 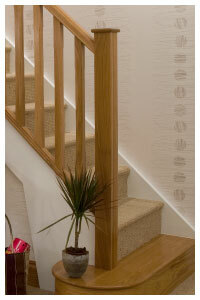 Home | Stairs | Stairparts | Terminology | Workshop |Staircase Plans | Jobs at Stairplan in Telford | Visit the Showroom. .